What is the color of truth? Is it black or is it white? Personally I think the color of truth is just gray. What matters … almost always … is the intention of our heart. What is honestly lies inside our heart that counts. My advice to my dear friend (you might know who you are) … your life is so noisy that you lost track of your own intention. But … well … I might be right and I might be wrong too. A true long-lasting friendship is about accepting your friend on his/ her face value … it is about accepting him/ her as who they are and not based on your own ‘dreamy or fairy’ imagination … saint like human friend. Errr … excuse my babbling here. I was just having a hard time moving on and leaving behind a soul … that I thought was my friend 😉 . The introvert in me … always causing me trouble keeping up with people around me. Or … maybe he/ she is just not a keeper? All of this delusional feelings that I have … most probably was due to the after effect of me working with something that I don’t really like lol. I have been playing with black color a lot more than I should this past few weeks. The truth is … black has never been my favorite color. I had enough darkness in my life to play with and I need light and colors to stay insanely alive. I am just glad that it was over now. I was working with GayaIzzah.com new Minimalist in Me/ Black Abaya collection for the past few weeks. Selecting, choosing, deciding, designing and photo shooting all black dresses for weeks. It gets to my nerved. I felt ‘eaten alive’ by the color … hate it (the emo me kan?). But, being a professional (I shall think so lol) … I tried to focus more on the journey and the moment spent while completing the collection instead of the heart wrecking feelings. After I completed all my ‘dark’ work … I decided to play with my colorful beads … a treat to a “tired” mind and soul he he he. So, I decide to create some bracelets that would match GayaIzzah.com ‘completely’ black abaya. And, pearls look so good if paired with a perfect minimalist black dress. Yeay! 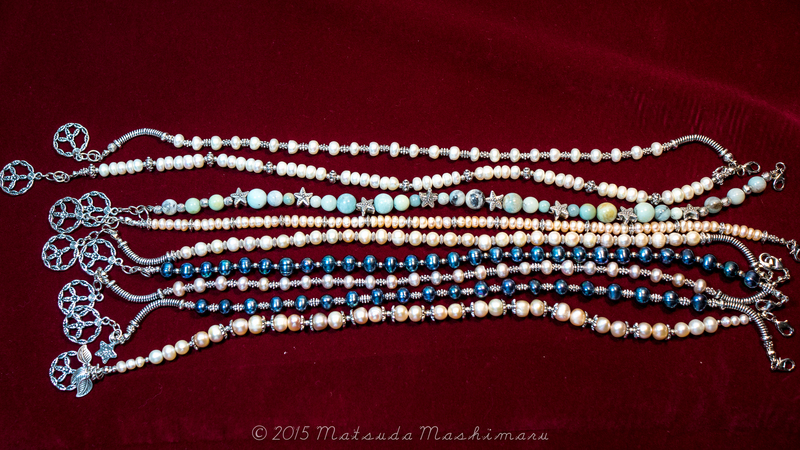 for myself as at now … I have 13 strings of bracelets in different shade of pearls. Half of it will be for my own collection … and the rest will be up for sale in GayaIzzah.com. p/s My quote of the day – I am busy getting STRONGER! Just came back home from my family vacation trip and end of the year is always the busiest as I needed to prepare my children for their 2015 school session. Being a mother is still my top priority job … and because of that little “peter pan” in me (aka my playful nature) , I always need to be reminded that I have children that will always looking up on me lol. Someone said that “One has to be an open palm. As soon as it clenches into a fist, the person looses the ability to learn and to enjoy new things. And, that is the onset of old age”. Thanks to my inner little “peter pan”, as at today … I still feel the joy of experiencing and learning new things. So, I promised GayaIzzah.com team for a proper jewelry collection during this year end event … and a promise is a promise (honestly I am so sleepy and tired right now). A good thing about doing something that I am so passionate about is … no matter how tired I am, at any time … when my hand touches my jewelry tools I will get excited again like that energizer bunny. 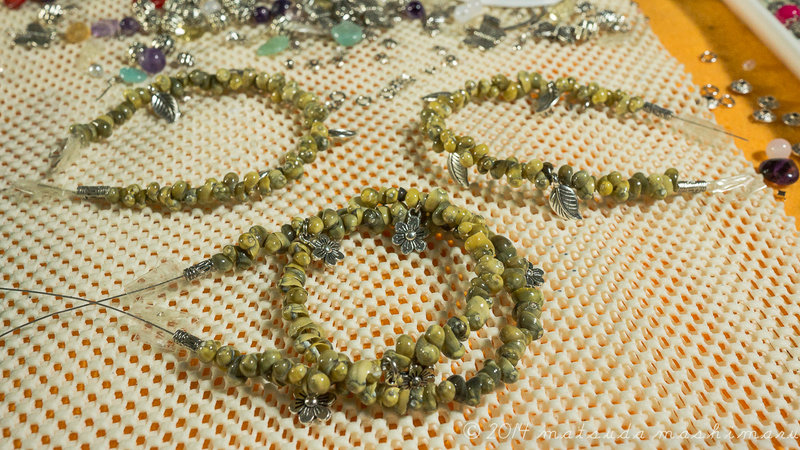 Restringing, improvising and redesigning my bracelet stock is in progress. Counting my time … need to finish this before Thursday. I had a hectic week and I miss my old house helper (Timah please comeback 😉 ) very much. My life has been in chaos for the pass few months without her and I really need my GATEWAY!! Enough ranting and back to work. 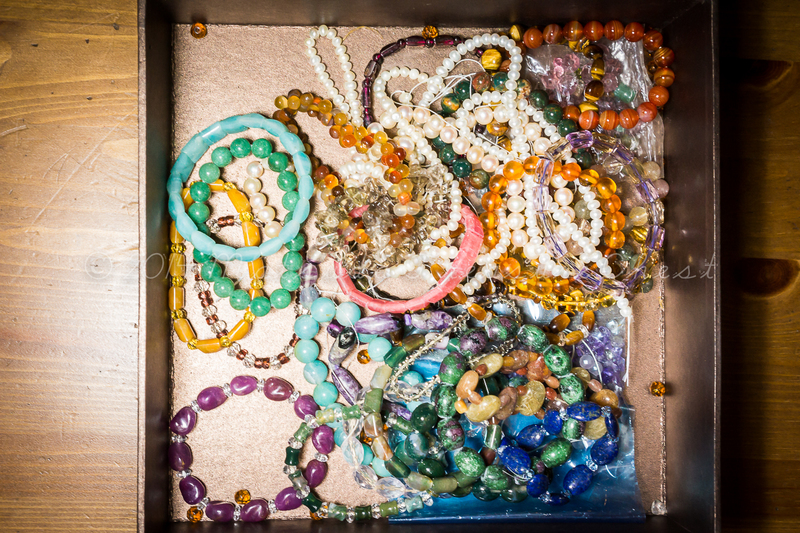 So, I challenged myself to create 10 bracelets out of this treasure box … but … I guess my brain can only produced 9 bracelets and boredom start to burst out from my chest 😉 . And, you can’t force creativity lol and the most important thing is I need to pack my bag for my next trip tomorrow. 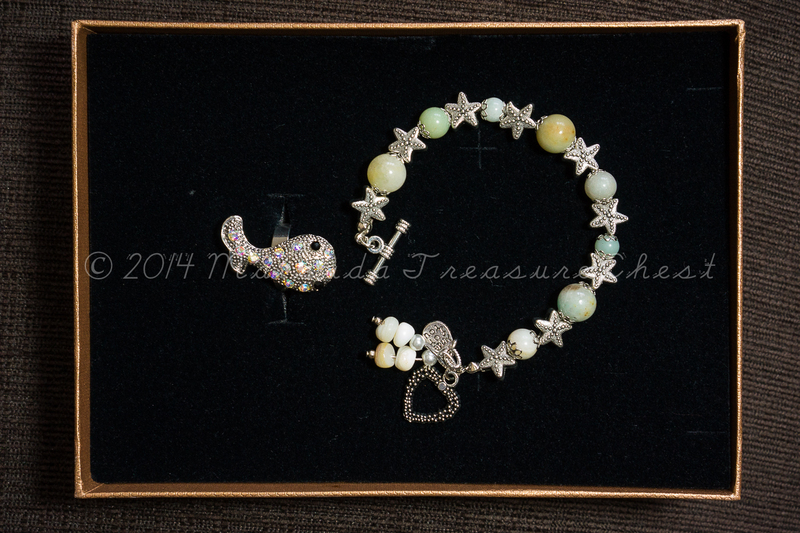 Part 1: Whose Treasure Chest is This? This is not my Treasure Chest for sure. One of my breakfast girlfriend got bored of her crystals (semi-precious stone beads) collection and wanted me to revamp her beads collection into something new and unique just for her. 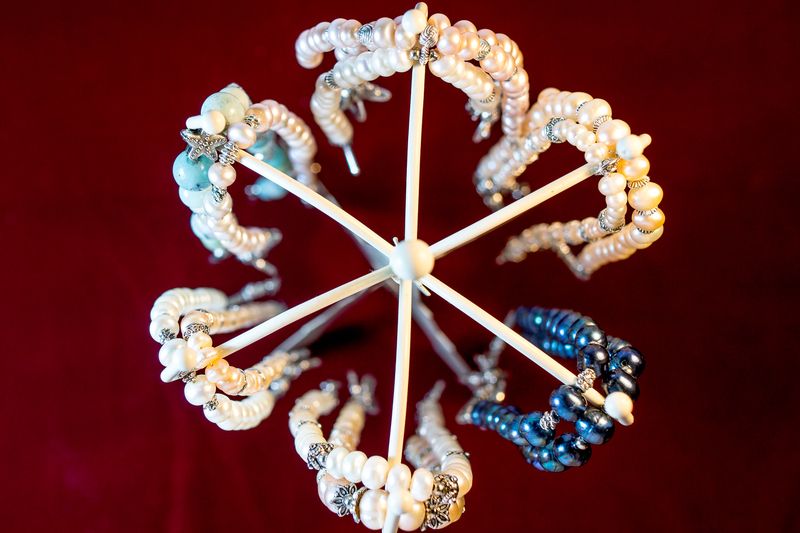 One whole box of all sort of semi-precious stone bracelets in god knows different mix of color and shape. And, it has been sitting there on my working table for the past 2 months. I need to push myself to start with her collection as soon as possible before I start to get crazy with my camera and my photography trips. Arghh … so many things to do yet I have only 2 hands. This is the time where I wish that I am an octopus … who has 8 hands 😉 . But, I want to be playful with her collection so, I am challenging myself to at least create 10 new and unique bracelets in 7 days. Last year, I visited Tibet via overland route from Xining to Lhasa (1,907km long). I had been curious about Tibet for quite sometime. The mysterious Tibetan that stayed up high on the mountain and their features looked a lot like the Native Americans in US, the stories of the Dalai Lama with monasteries and nunneries playing a very strong role in Tibetan culture, the political struggles and so on. 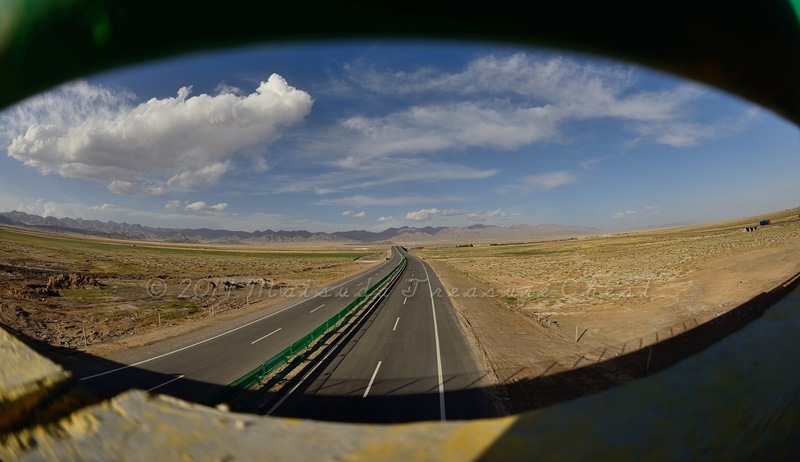 My road trip started from Xining and ended in Lhasa, covered only a small portion of the geographically huge and famous Qinghai-Tibetan plateau. The Tibetan plateau was amazingly vast and as I can see it … Tibetan inherited a freedom of space from their ancestors, the sky was the limit. But the vast geographical space smelt resistance. Checkpoints by stern police and army personnel at every border crossing point created unnecessary twist on my stomach (checking for travel permits, passports and sometimes just finding excuses to look at your face). There were police personnels at every corners in Lhasa too. And, the risk of experiencing altitude sickness was very high here as Lhasa itself was located at 3660 meters above sea level, passes and some inhabited plateau areas that we passed through along the way were mostly over 3000 meters. 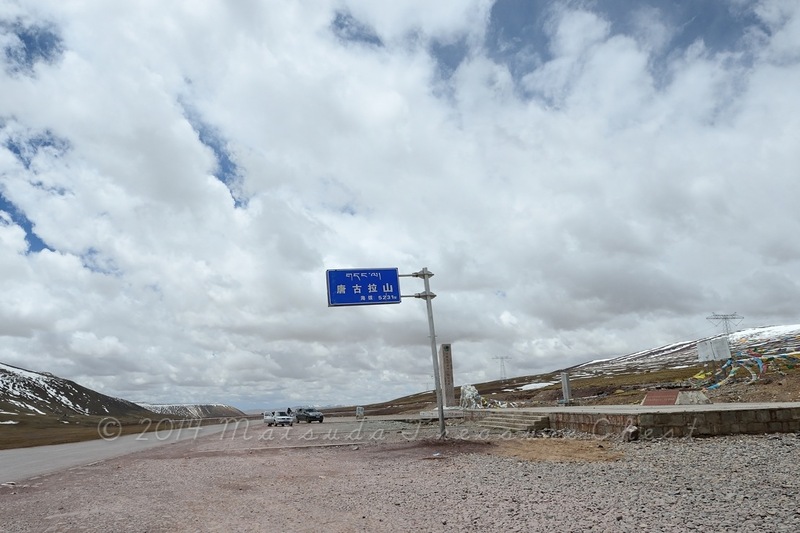 The highest was at Tanggula Mountain pass at 5231 meters. I thought that I could survived this journey without popping in the anti AMS pill but I started to experience a bad headache when I was at Xining (2275meters). The pounding headache stopped only after I took the anti AMS pill. Our journey from Chaka- Geermu- Tuotuohe- Dangxiong felt very isolated. It felt as if we were in a twilight zone. Some nights we were totally disconnected from the world (no phone signals at all, no electricity, no pipe water etc). The view along side of the roads were empty, bared and cold. No trees just piles of rocks, occasionally some open grasslands and plains (totally inhabited). The huge and beautiful man made roads were empty except for some trucks and a few daring motorist like us. The landscape view was splendid, the sky was in deep blue color and the clouds were thick like cotton candies. I had a blast time admiring the sky and the clouds … God’s blueprint was everywhere for the thinkers to witness and to confirm on HIS existence. For more landscape photos taken during this trip, please browse through my Tibet Zenfolio photo gallery here at Minimalist Mindset in Tibet. I seldom feel homesick when I travel but during this trip after a week on the road, I started to feel bored and restless. The journey from one point to another was too long … and most of the time we were stuck on our seat in the bus. Plus the constant headache that I had, some drama here and there makes me a bit tired. I think it would help to have a good companion during a hard trip like this. But finding a good travel companion was not easy. Some times a good companion during our ‘laughing’ time would turned into a monstrous companion when we were on the road. Me? … I prefer to be alone and sticking to my own business, less drama and less distraction. Kurang kan kontroversi, tingkat kan produktiviti (less controversy, more productivity 😉 ). What else did I see during this trip? From the eye of an outsider who spent just a few days mingling around locals there, what I noticed about Tibetan was their devotion towards their religion. 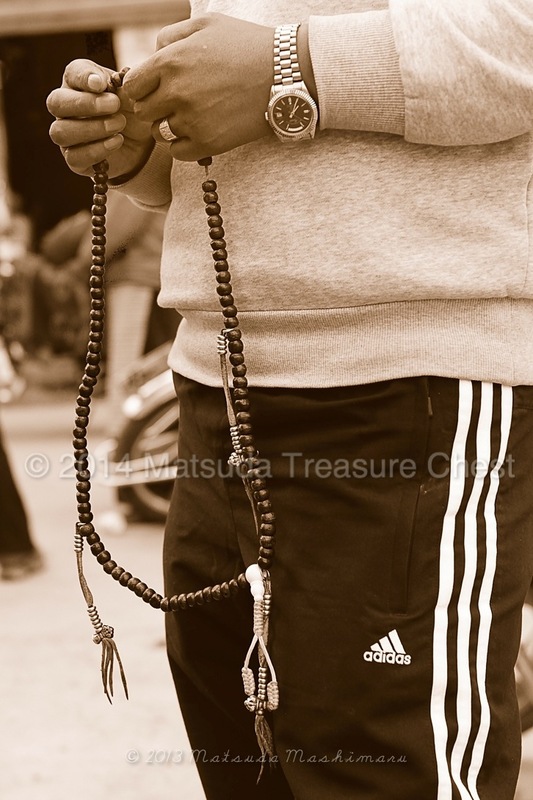 It seems like most of them had that praying beads hanging at their finger tips at all time. 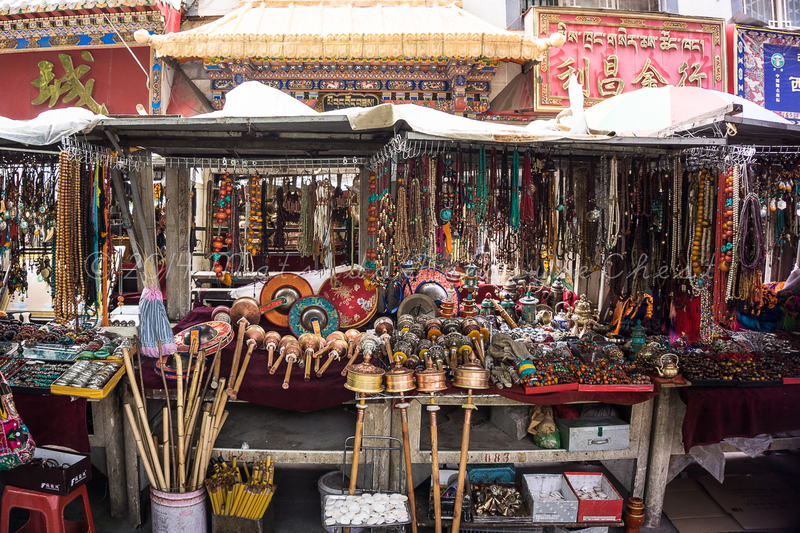 Most of them were Tibetan Buddhism but … I did meet some muslim Tibetan while I was roaming around Lhasa’s back alleys. We came across a few monks performing their ritual act of religious … prostrating at the road side of Geermu on their way to Lhasa. Amazing devotion … it took them a few weeks to reach Lhasa and they survived through donations (food, water and shelter) from passers by. Talking about being a complete minimalist and living with no material burden at all, I think they were obviously a champion minimalist. I am a self declared minimalist myself but for this trip I went overboard with my luggage and I left traces everywhere (i.e left my favorite jacket at one of the hotel and a few more here and there). It created unnecessary worrisome to my ‘simple’ mind. I had been taught well during this trip on why I need to be a complete minimalist traveler. Nowadays I traveled super light (except for my never ending struggle with my photography’s gadget). I applied the same minimalist method of living to my personal life too, yeah I don’t visit shopping malls as frequent as before and I am more mindful on my spending (except on my camera gadgets 😉 ). But, hanging around GayaIzzah.com gang and my Breakfast buddies … wow! I am diverting my fashion shopping from the malls to … online shopping arghhhh! So, what did I get for myself during this trip? Honestly, I didn’t grab anything for myself because nothing caught my eyes. 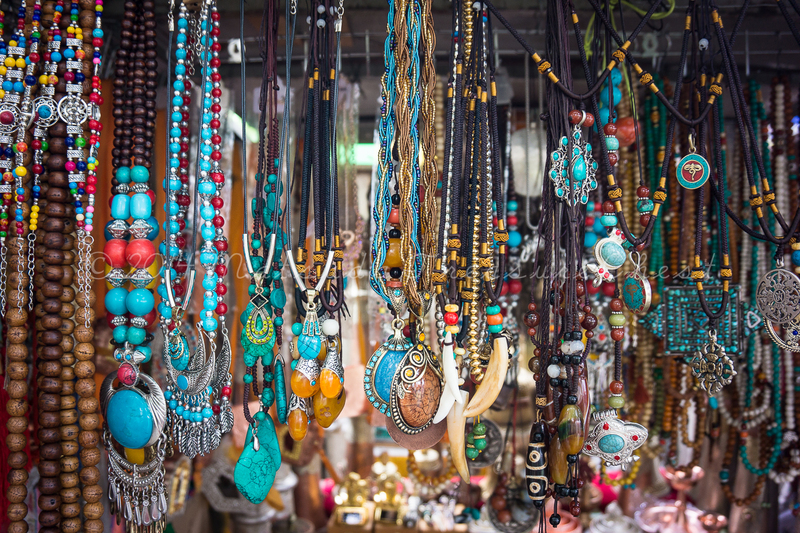 Bought some souvenir for friends and family but I discovered that I can get all these touristy Tibetan jewelry here in Kuala Lumpur with much cheaper price. 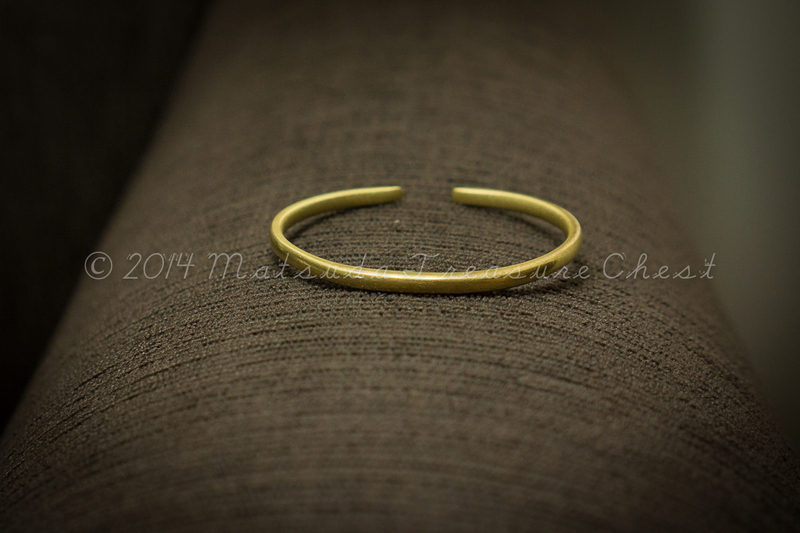 You can find made in China jewelry just anywhere in Malaysia, no big deal. I bought one weird looking pendant for my daughter for 20 Yuan (after much bargaining). While doing my soul cleansing (my jewelry soul cleansing 😉 ) at Ikano Power Center in Damansara, Kuala Lumpur … darn! I saw a replica of that necklace pendant (a cat face instead) at RM10.00. Wow! lesson learnt … girl! … you are a lousy bargainer, lol. I have been resting well these few months and I will be traveling on and off again starting this September until the end of the year. 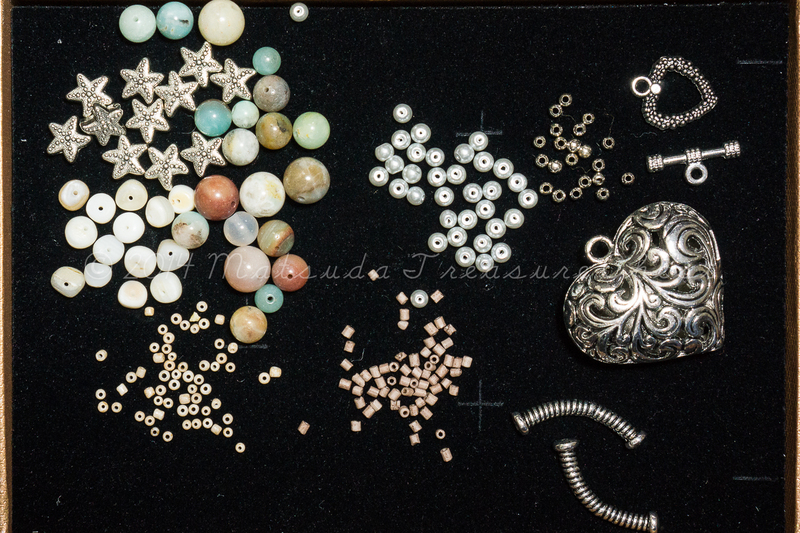 Before my mind goes cuckoo while wondering somewhere in Neverland, maybe now is the best time to re-organize and re-check my stock of jewelry findings and beads. At least I would have a clear idea on how and what to get on my next purchase. Been having too much fun shopping for beads during these few months. 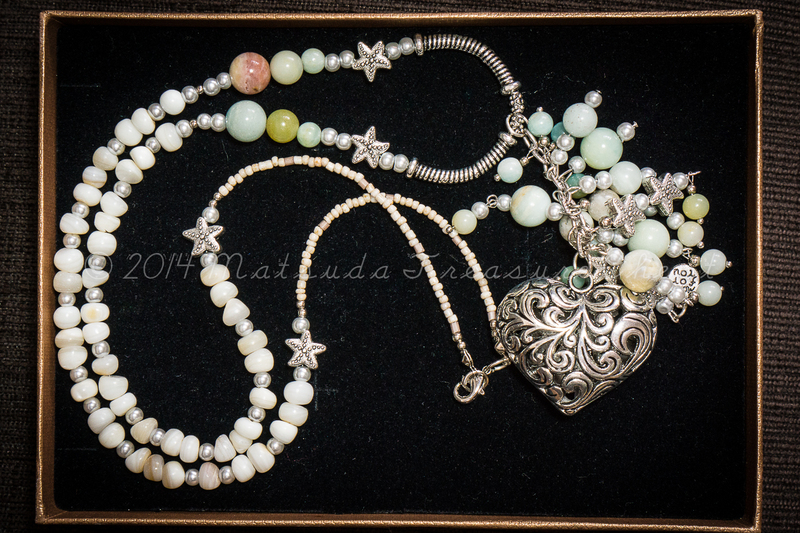 Most of the time, my beads selections comes from my subconscious ‘heart’ instead of from my conscious ‘brain’ . While doing my bead’s “spring cleaning” process, I noted that my beads collections are mainly dominated by BLUE colored beads and … this is not a good sign. Some of the BLUEs need to go. So, as part of my “spring cleaning” effort I am declaring that the color theme for my September 2014 collection will be in the shade of BLUE. 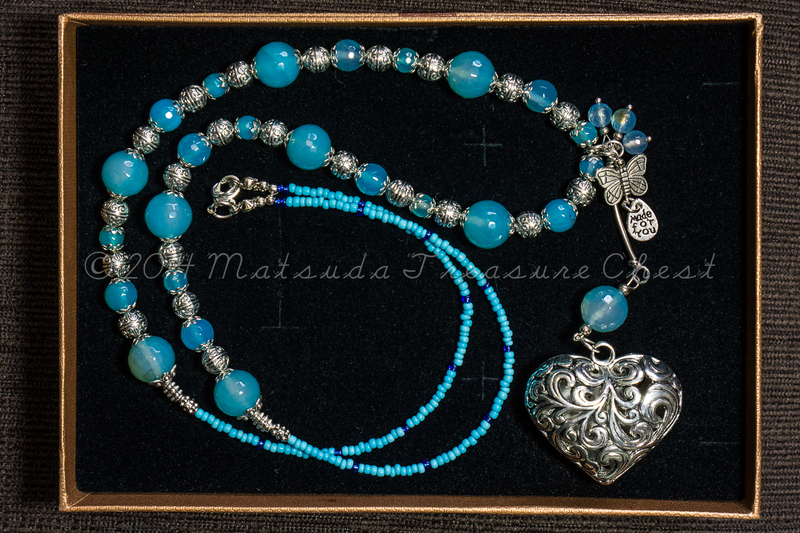 My True Blue jewelry set is now on sale at GayaIzzah.com Facebook page and GayaIzzah.com IG account. It is made of dyed blue agate (natural stone), rhodium plated steel beads, rhodium plated steel pendants, rhodium plated steel toggle/ findings and stringed with wires. 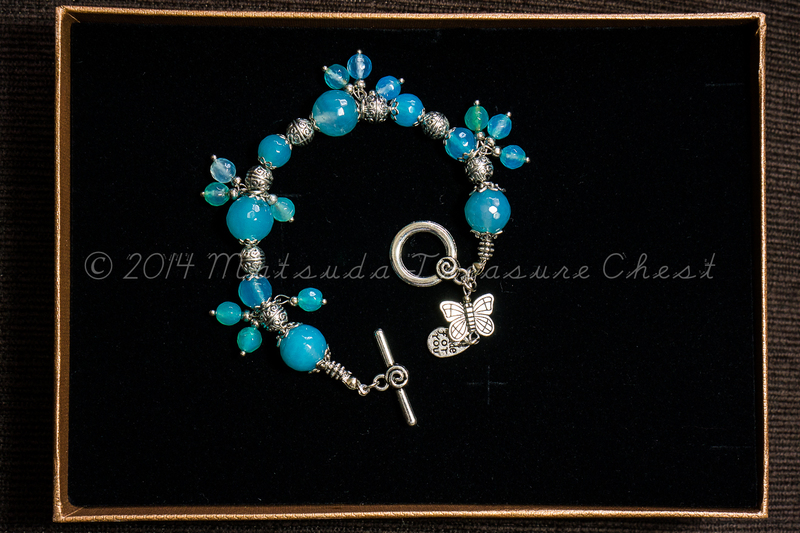 Set of 7 BLUE bracelets are available for sale too. Please visit GayaIzzah.com Facebook page for detail descriptions of each BLUE bracelets. Hanging around the beach with a camera is so much fun. 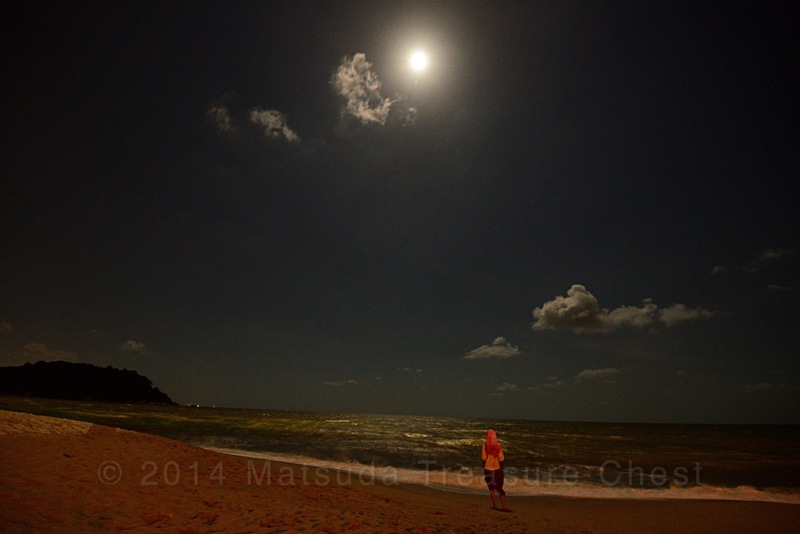 Apart from shooting the same old sunset and sunrise, shooting moon rising (full moon) is also a cool thing to do. Watching the moon rising slowly while enjoying the night breeze is priceless. I did that once with my lovely ‘chatty’ daughter, yeah she talked a lot and I could not focus well 🙂 . And, like all the time we ended up doing our cat fight while watching the moon and me kept telling her to keep her voice low and she kept on reminding me that I love my camera more than her arghhh!. 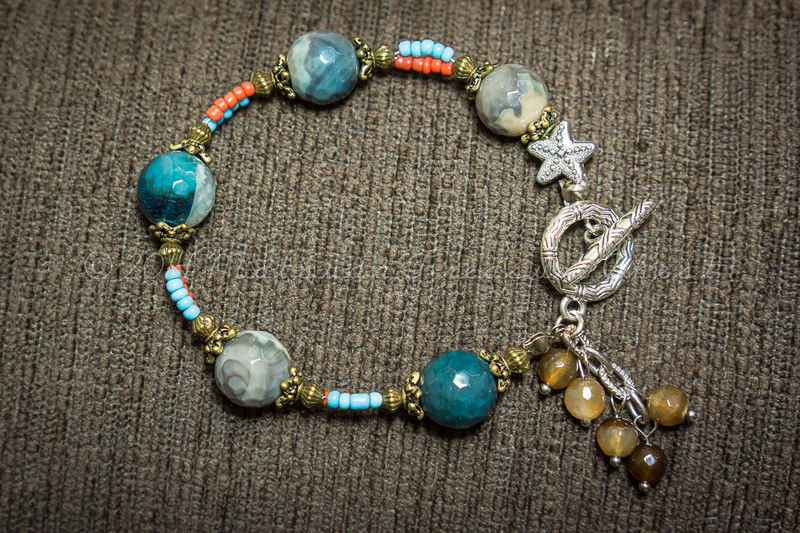 I am thinking of creating a bracelet and a matching necklace that would remind me of the beach. 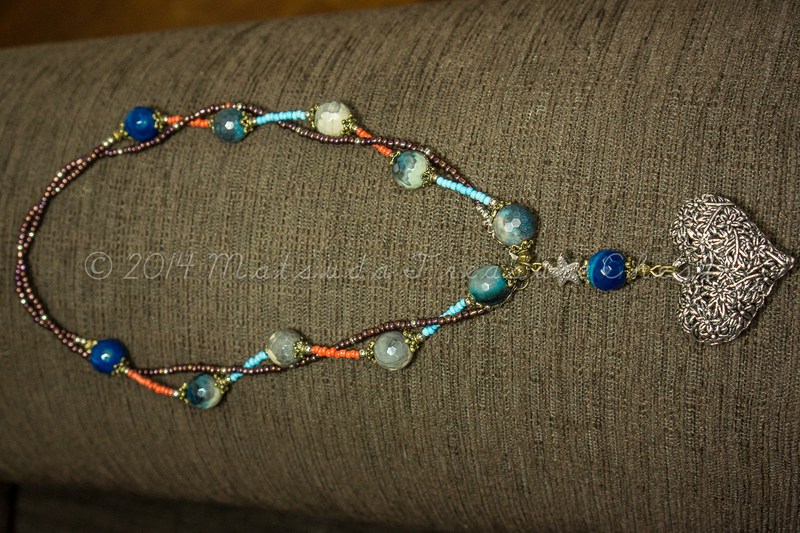 I want to make it a bit dreamy with tangling stones hanging around my pendant. 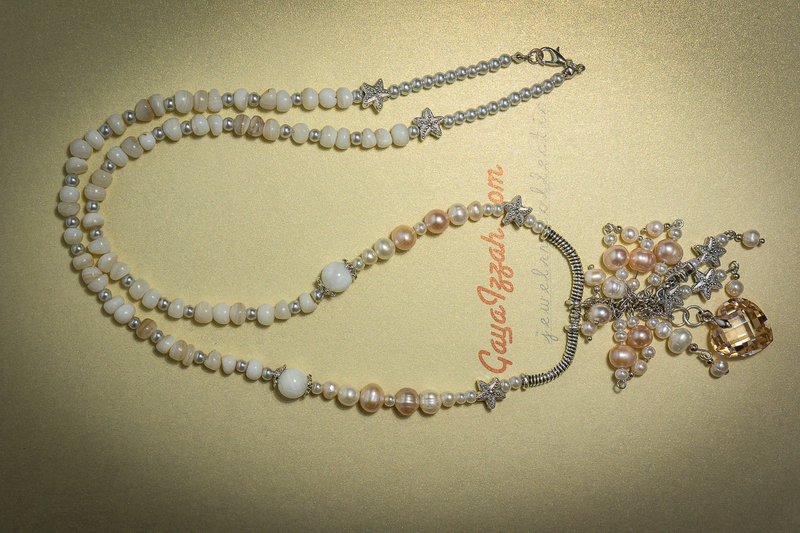 So, a mixture of milky colored agate stones; milky colored shell beads; ‘silverish’ colored pearl seed beads; ‘sand brown’ colored glass seed beads; some metal starfish beads and a big steel pendant to add some drama into it; and wallah! a dreamy necklace 😉 . 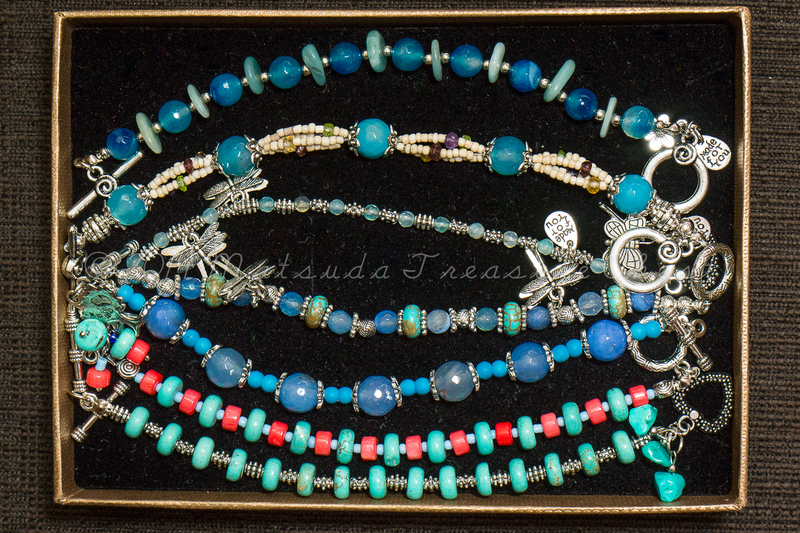 I was in the middle of editing and organizing my 1000++ Ethiopian images when out of boredom I decided to create a necklace and a matching bracelet that will remind me of Ethiopia. Out of my remaining beads, I found some earth tone dyed agate, combined it with some colorful china seed beads and matched it with a rhodium plated steel pendant for my necklace. You can wear the necklace in 2 styles, remove the attached hook then you can wear it long (about 43cm diameter) or just wear it short like the picture shown above. And, the same combo beads also goes to my Ethiopian inspired bracelet with some little brown agate gemstones tied together to the rhodium-plated steel toggle. Please check out Gayaizzah.com page and IG for details. I grew up believing that Utopia and Ethiopia is the same place. Had a rough childhood and I like the idea of living in Utopia where the community/ people were heavenly pleasant, even a little-lost child can roam freely without worries. In reality, Utopia and Ethiopia is a completely different opposite in every each way. I discovered that Ethiopia is an African country next to Somalia and famously portrayed as a poor, underdeveloped country and prone to experience famine, just like the rest of its neighboring African country. This country or any other African country has never been listed on my bucket list – of places that I need to visit before I die. I was at Omo River Valley of Southwestern Ethiopia last year visiting a few ethnic people of Ethiopia like Karo, Hamar, Benna, Mursi and Dassecnech. The people of Hamar struck most of my attention probably because of the way they carried out themselves. They seemed to have the air and pride of a warrior. The same feelings that I felt while I was lingering around people of Afar from Danakil Depression, Northern Ethiopia. While hanging around with them at the market and their village, I noticed that male and female of Hamar people are very fashionable and colourful people. The choices of color on their jewelry were strikingly matched their skin colour. 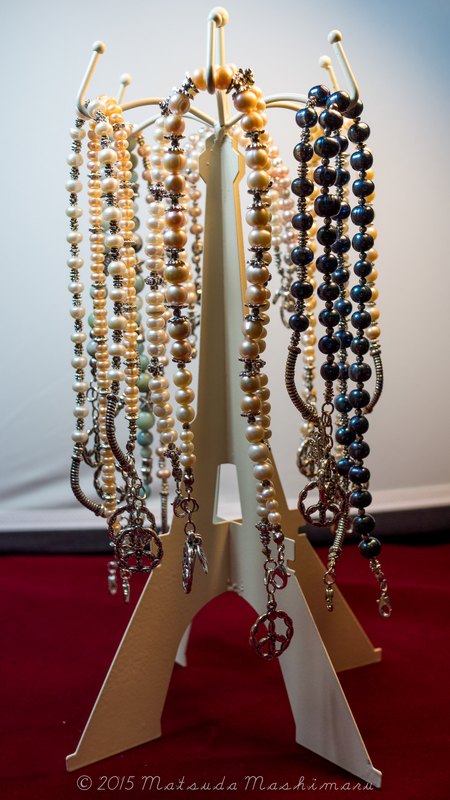 Their jewelry and accessories were either made of African seed beads or metal (like brass, copper and silver). 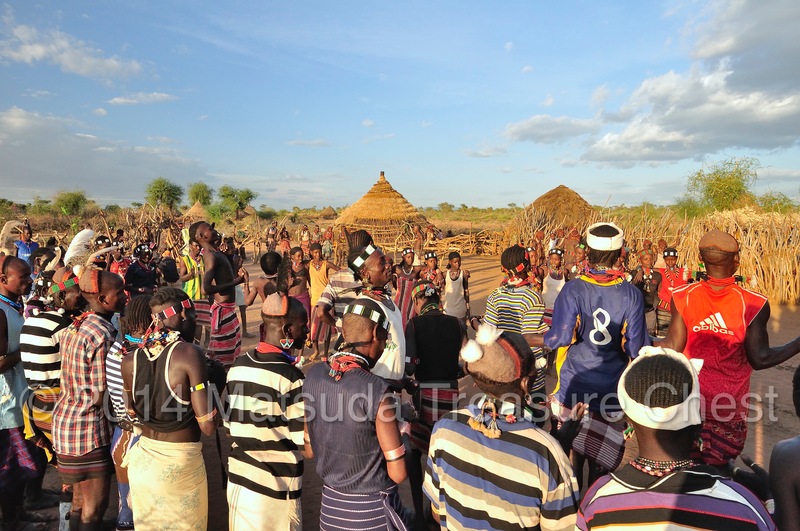 Lucky me, I had the opportunity to attend the famous Hamar Bull Jumping ceremony and a wedding celebration back in their village. Bull jumping or bull leaping ceremony is where a Hamar man has to successfully leap over a line of cattle in order for him to get married. It is an initiation right of passage to qualify him to get married, own cattle and have children. And, I managed to witness and captured a collection of photos of them with their full jewelry on display during both of the ceremonies. Images taken during my visit to the market, the Bull Jumping ceremony and during the wedding celebration are compiled into a gallery below. Detail description for each photo is included, click on each photo for full view and full description of the image. Most of the Hamar men wear abundant of their jewelry and accessories at the same time. While hanging around the market, I noticed that Hamar men love to look good even when they are at the market. Before the Bull jumping ceremony started, women from the groom’s side need to endure a series of whipping on their flesh to prove their love towards their men. Honestly, it was not a very pleasant scene to witness. I was uncomfortable by the whipping sounds and seeing blood oozing out from a dangling flesh was not something that I want to share here. But you always can google for further information about the ceremony. The Hamer women are as fashionable as their men. If men can show off their brave accomplishment through their body scars and mud cap, women of Hamar have the same way to display their braveness and status to the public. I bought myself a bracelet during my second trip there, a simple metal bracelet just to remind myself that I survived the Danakil Depression (the hottest place on earth). We were at the Dalol of Danakil Depression campsite when I saw Muhammad, a local Afar boy, wearing a bracelet that I kind of like and I ended up buying it from him for 300 bir. Well, I know it was kind of expensive but I was desperately in need to reward myself for being able to endure the agony that I had to experience during my visit. A sweat agony indeed … love every moment I spent here in Ethiopia … alhamdullilah. After 10 years (yes! 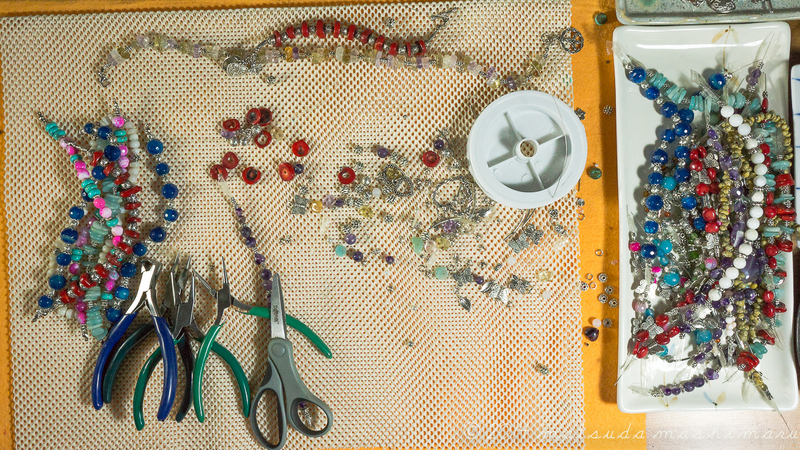 I know … I am old but I have a very young heart), I decided early this year to revisit again my old beloved passion on beading. Did some intense traveling around the globe these past few years just to figure out what I am made off and I figured that life is short, why wasting time wondering either I can or can’t do the things that I wish that I want to do. This is my first post in this blog. 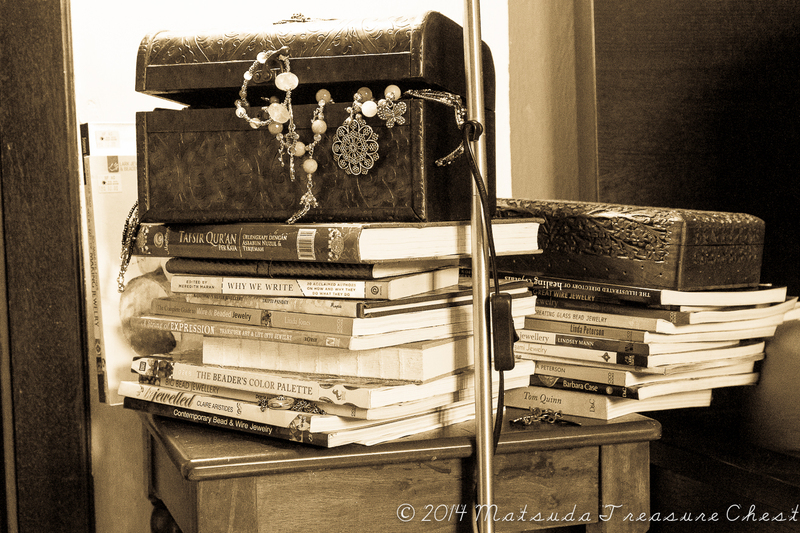 Trying to link my passion for photography, traveling and jewelry making into one ultimate masterpiece. 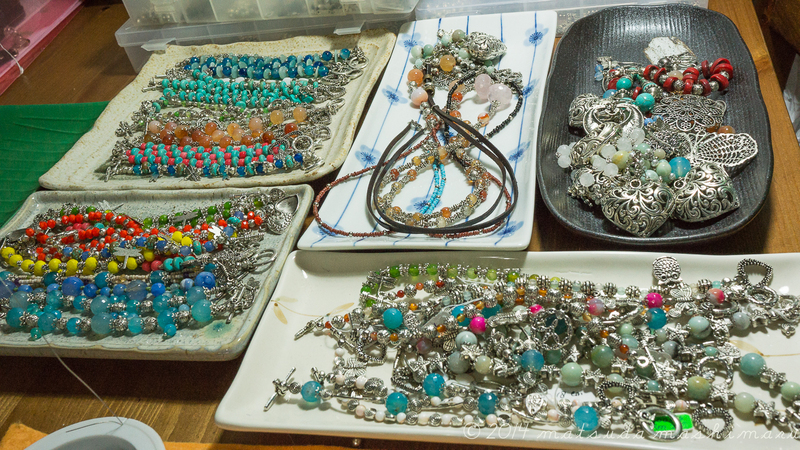 For a few months, I did some intense read up on jewelry making particularly on beading and attended a silversmithing course in Jogjakarta, Indonesia reason being to brush up my jewelry making skill and at the same time trying to boost up my confident level before I decide to totally jump into doing this for a living. 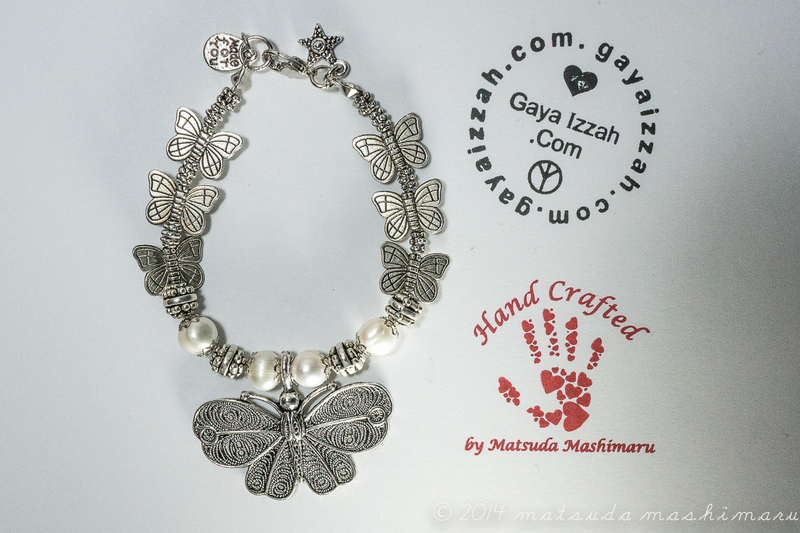 I had completed some bracelets and necklaces for GayaIzzah.com first jewelry collection targeting for young women last month and alhamdullilah the respond was quite encouraging. 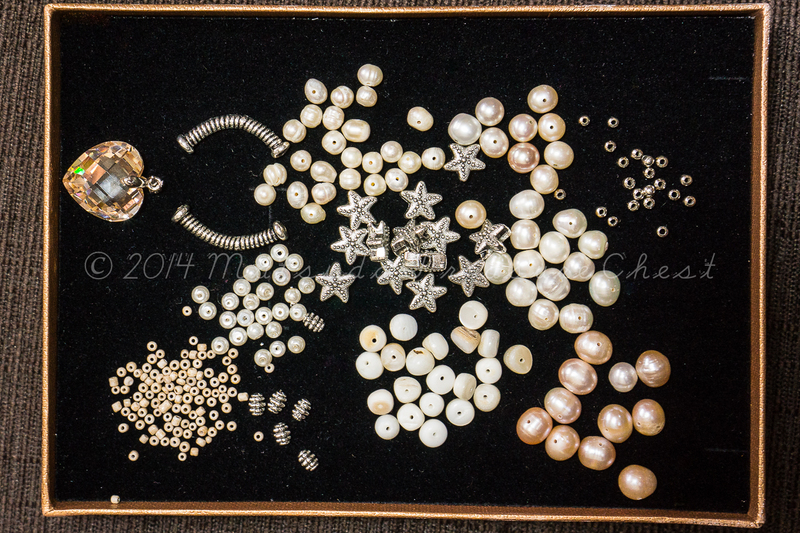 I am currently working on the next set of jewelry collection from the remaining beads that I have in stock coupled with various color of freshwater pearls from Sabah. 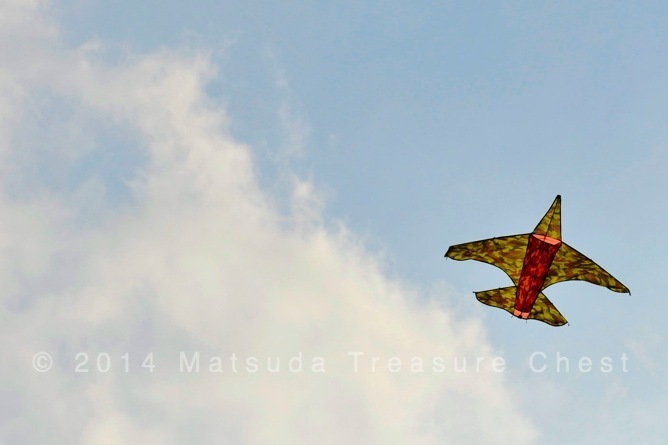 The next collection is targeted for completion in September 2014. Fyi September is a very special month both for me and for GayaIzzah.com team. So my dearest readers, wish me good luck yeah for my next upcoming creation.